BGP configuration is quite different from other routing protocols configuration. 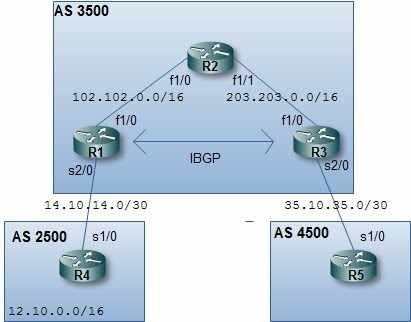 There are two kinds of BGP, which are IBGP and EBGP. EBGP is when BGP is configured between routers in a different Autonomous System (AS), IBGP is when BGP is configure between routers within the same AS. EBGP behaves differently from IBGP. We will see what other differences are as we configure BGP in the following topology. In BGP we have to specify each of our neighbor manually and the network command work differently as with other routing protocol. We will start by configuring every interface and start BGP in each router. At this point, you can run the "show processes" or only "show processes | include BGP" (the BGP should be in upper case) command to see that BGP processes is running. You can also use the "show processes cpu | include BGP" to see the cpu usage instead of the memory usage. If we are using loopback interfaces for BGP neighbor, remember the "update-source" and "ebgp-multihop" command. Because loopback interface is not a directly connected interface, we need the "ebgp-multihop" command to make the EBGP neighbor works. For IBGP peer, the "update-source" command is used instead. Then we use the BGP network command to advertise this network. In BGP, the network command should match exactly the network address and the subnet mask that is to be advertised. At this point, the network won't be advertised not only to R3 but also to R4. You can verify this network being learned by both routers by issuing the command "show bgp". The idea is to first create an access-list that will deny the route that we do not want to advertise, that is the 110.11.11.0/24 network. Then we will create a route-map that match the access-list, which will deny the unwanted routes. Finally, we apply the route-map to the R4's BGP neighbor command. The out parameter means we want filter outgoing networks to R4. If there's no changes after applying those commands, try to clear bgp process on R1 and R4 by the command "clear ip bgp *". Next, We will try to advertise network 12.10.0.0/16 from AS 2500 to AS 4500. To achieve this, we must concern the BGP synchronization rule. First, we enter the network command on R4. At this point, the network should have been advertised to R1 and R3. But in R3, the route won't be installed to the routing table. And also the network won't be advertised to R5 because of the synchronization rule. First we will make the route installed on R3. If we issue the command "show bgp" on R3, there's no best mark for network 12.10.0.0/16. Now, the route should have been chosen as the best route on R3. Next, we will make the 12.10.0.0/24 network to be advertised to R5. To achieve this, we can either turn off synchronization rule or redistribute the 12.10.0.0/24 to a running IGP, that is OSPF. We will try to redistribute the network to OSPF, so that the BGP network comply the synchronization rule. Now, if we issue the command "show ip route" on R5, we will see that there's a route to network 12.10.0.0/24 and is learned via BGP. We also see the 110.11.11.0/24 network advertised to R5, because no route-map is applied to filter this route. Now, the BGP is working and routes have been advertised each other.